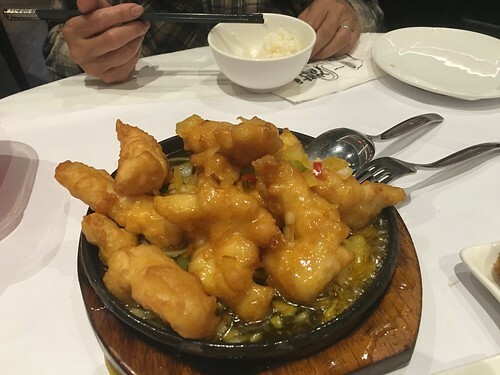 Quite a while ago, the in-laws took me to Yum Cha Cuisine in Garden City for my birthday dinner in September. There are a number of Yum Cha Cuisine branches and the one in Garden City was the only one I have visited so far. It was busy that night, however the service was still impeccable. 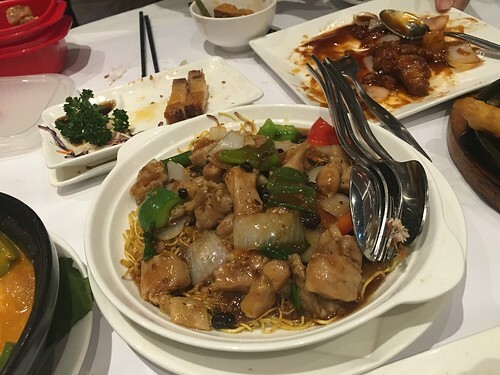 We ordered one of the set dinner, which was served with free soup and steamed rice. Besides that, we had additional small meals from the dim sum menu (still available during dinner service). Things to note is that, if we bring in our own personal tea leaves, the surcharge is $1/pax rather than the price of $2.50/pax. 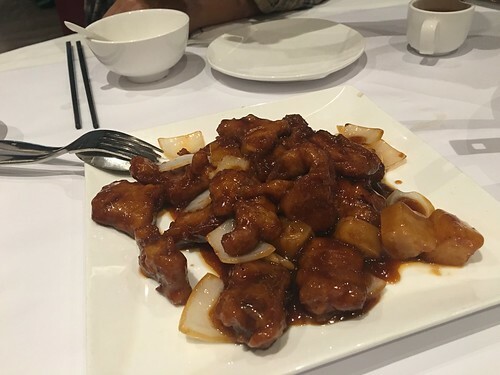 My cravings for sweet and sour pork continues during the pregnancy and it is a must order if we go out for Chinese cuisine. That night we had something similar, and I must say, I was satisfied. 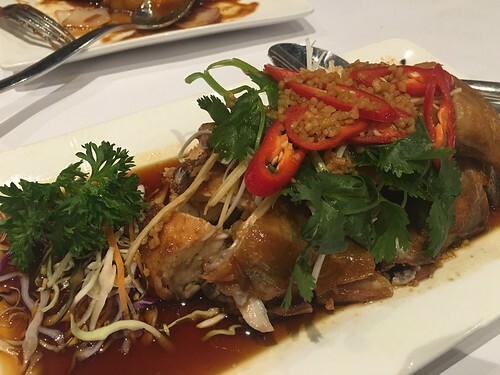 Other meals on our table include the roast chicken, seafood tom yum tofu, sizzling fish and black bean pork noodles. We were happy with all the dishes that night. The chicken was tender with crispy skin, and the tom yum tofu was a delight. 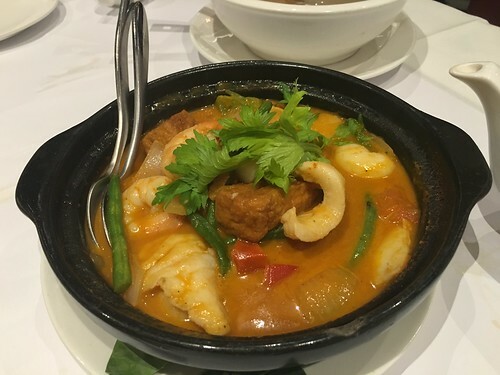 I enjoyed the creamy sour spicy tom yum sauce in the claypot! 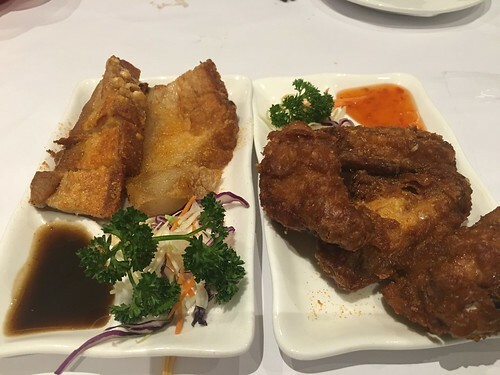 As it was a birthday celebration, we ordered additional roast pork and crispy chicken wings from the dim sum's menu. I found that to be quite salty. 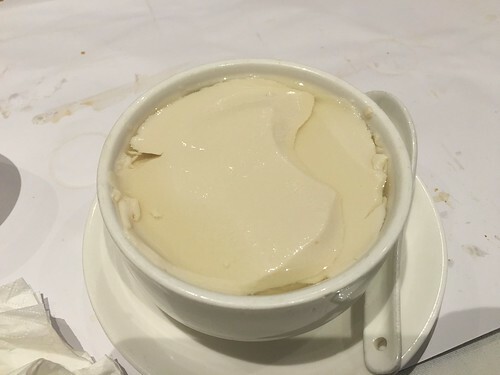 Lastly, we had a complimentary 'tau fu fa' dessert, which was quite good but certainly not as authentic as those back from home. The meals in Yum Cha Cuisine are fairly impressive and authentic. We visited this place for yum cha too and I would have to say they were good. Their mango pudding is a must try! I could not wait to return to this place with hubby and Little G in the future.